Putting a green roof on our house has been one of the most physically challenging and rewarding projects I've ever undertaken. 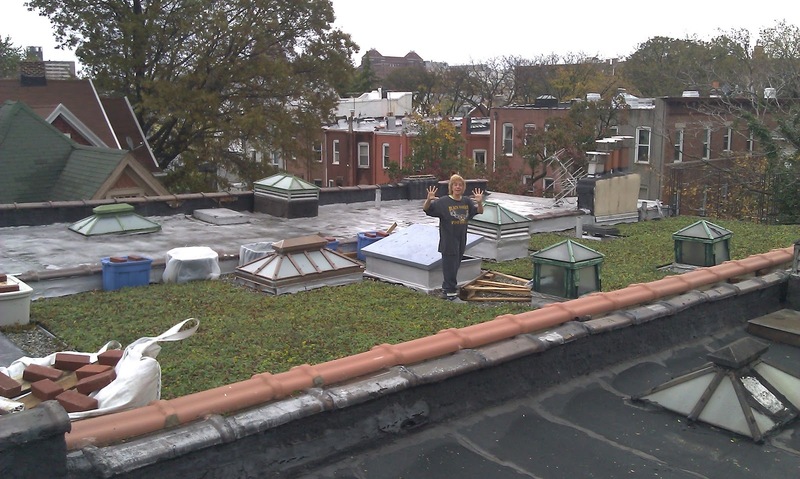 My dear friend, Andrew and I spent years designing a green roof for Cindy's and my house. 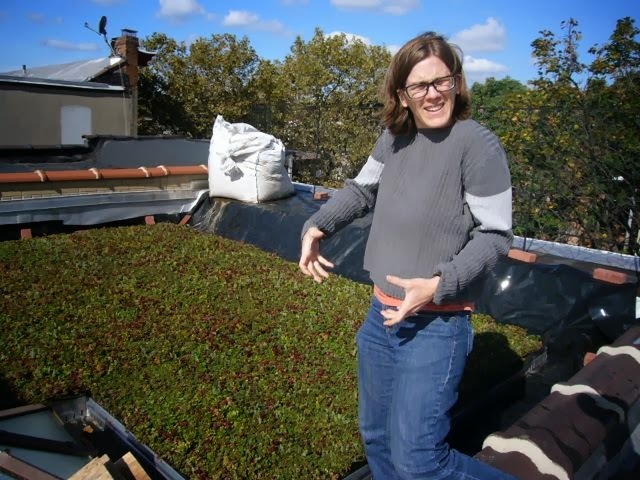 But, when I brought Inger Staggs Yancey (owner of Brooklyn Greenroof) onto the project, we were able to find out the rules and requirements for installing a green roof in New York City. Inger took care of hiring the structural engineer (to give us our weight load capacity for the roof), submitting the paperwork to the city for permits and the real estate tax abatement, and ordering the materials, a couple of guys for the first two days of the install, and the knuckle boom crane. 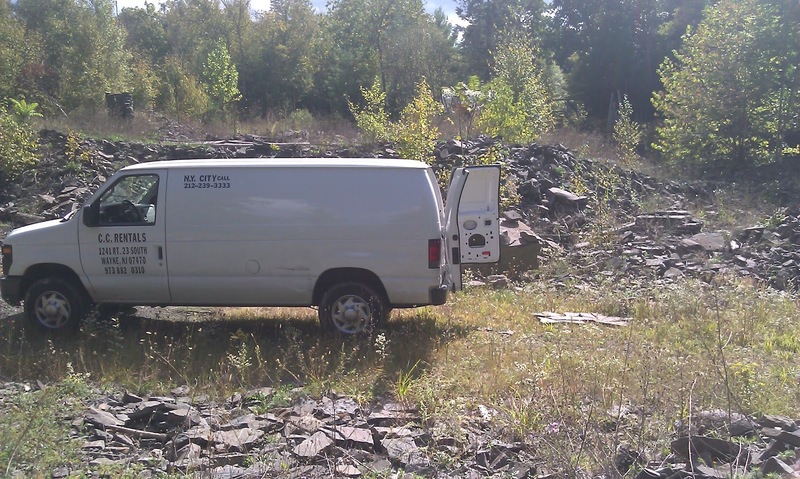 After I finished building and installing the railings at the front and back of the house in late Summer 2012, I took my last weekend before the green roof install to go upstate with a rental van to our friends' bluestone quarry. I wanted to get some stepping stones for the roof. 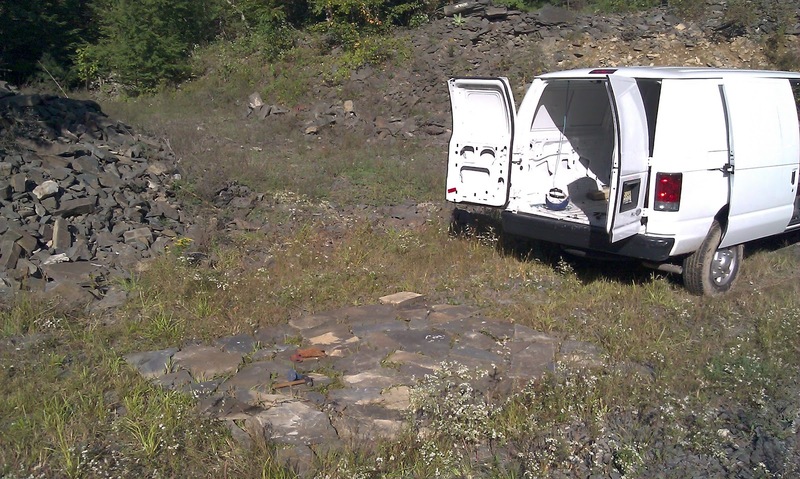 Here's the van parked in the quarry. 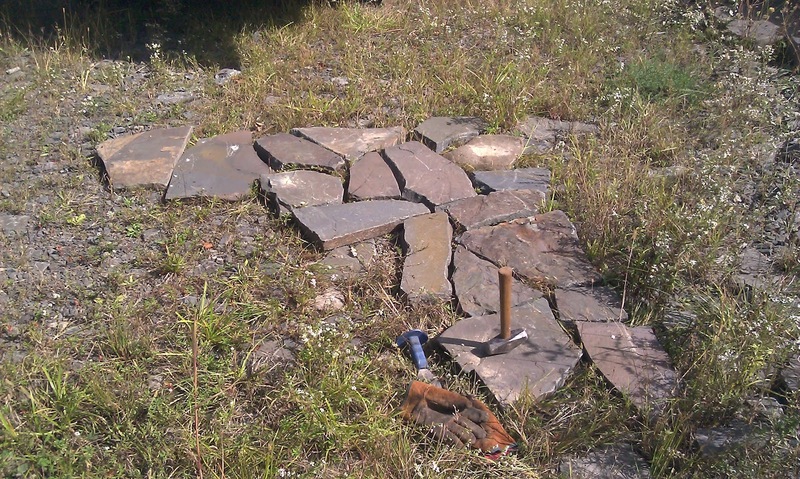 I picked out as many flat stones as I could find, and I laid them out on the ground to get a sense of how much surface area they would cover. And here's everything packed in the van (trying to keep my stack shallow so things didn't slide around). It was a beautiful day to play with rocks. 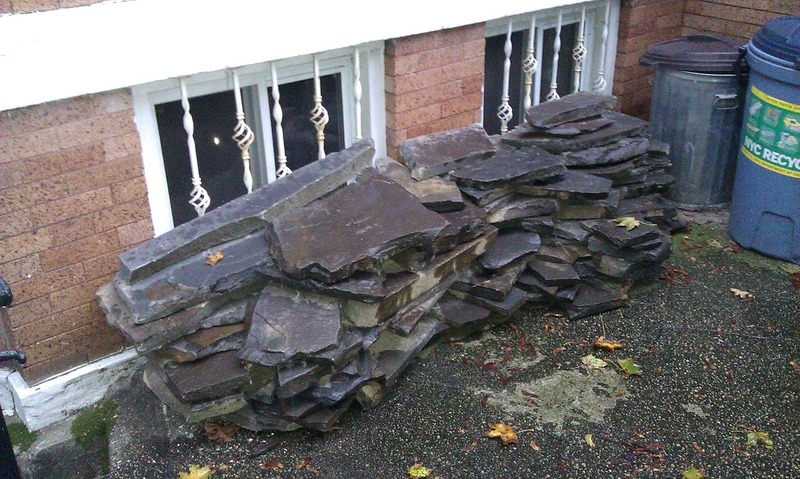 This pile of rocks sat in the front yard for months. It was a long journey between getting them from the quarry and finally being able to install them on the roof. I didn't want to put them up until after the inspection, and that didn't happen until the Spring of 2013. 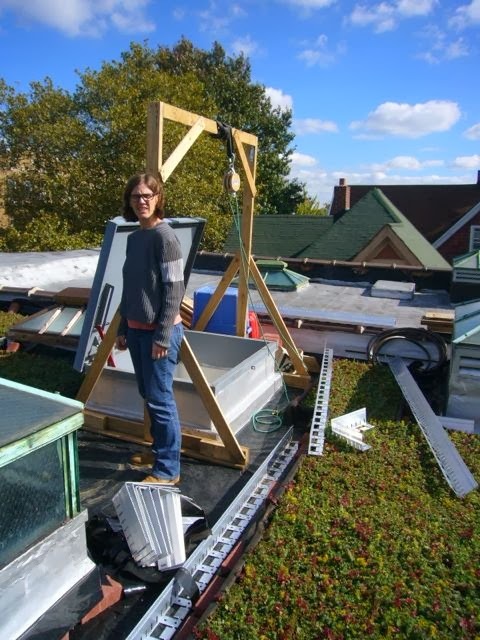 Unfortunately, Inger wasn't able to get all of the supplies for the green roof delivered on the day the crane was on site. 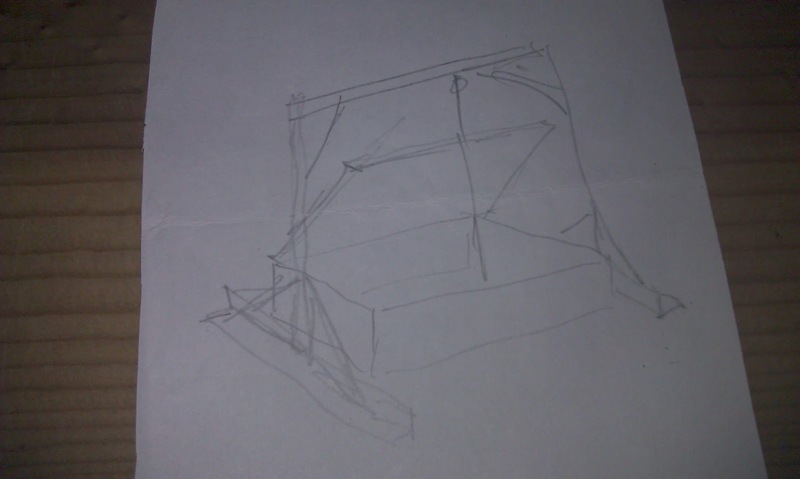 So I designed a gantry to haul all the heavy things up to the roof through the hatch. I borrowed a block and tackle and a sling from work, but the green rope was my own. I had been using that rope to haul railing sections and my tools up to the roof by hand all summer; it was rated for 200lbs. The gantry was made out of scrap wood found on the street and wood from an old futon frame that I'd salvaged. 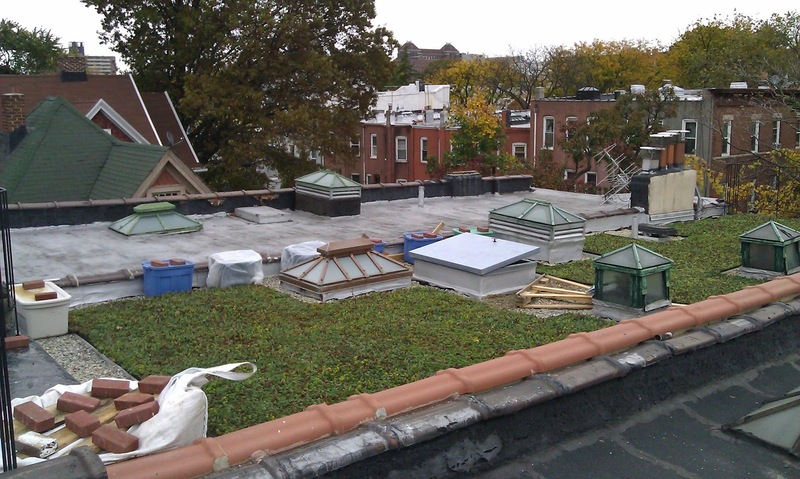 Dwain Lee took this photo on the first day of the green roof install. After we swept the roof, we had some down time before the delivery truck arrived. Here are the two fellows from The Hort who were hired to help with the install. I wish I could remember their names. Between them is a Johnny Depp tee shirt being worn by one of my best friends in the world, Bernadette. 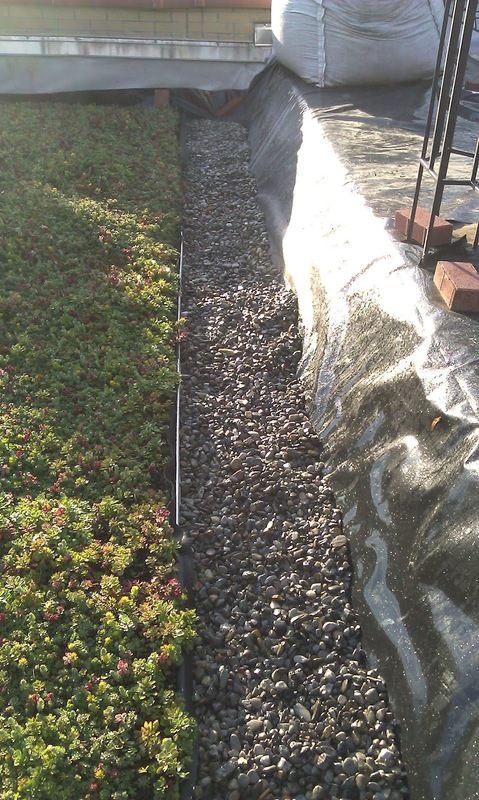 The first things to come off the truck were the roll of sheet plastic that acts as a root barrier (to keep any super-long roots from eating away the rubber roofing membrane), and the drainage sheets. And here's the root barrier going on. We overlapped the layers by about a yard, if my memory is correct. Chip, Bernadette, and I followed the root barrier team along with the plastic drainage layer. It's looks sort of like plastic egg crates, but there are tiny drainage holes at the top of each peak to allow rain water to percolate down and off the roof after the little cups fill up with water. We set the circular saw blade to just under the full depth of the plastic, and we cut the pieces over a board, so we didn't knick the sheets below. We used the handsaw to cut through any remaining areas where the circular saw hadn't fully cut through. And this is me playing straight-edge air guitar. Perhaps Chip is not impressed? I did actual work too. That's me in the background. The aluminum edging didn't arrive in time for the main green roof installation, so we used spare lumber that I had in the basement and a giant pile of bricks (which we hauled up by hand) to bolster the edges of where the dirt would go. And then then the drainage layer was covered with filter fabric before the end of the day. The filter fabric, by the way, keeps the dirt from filling up the little cups in the drainage layer. 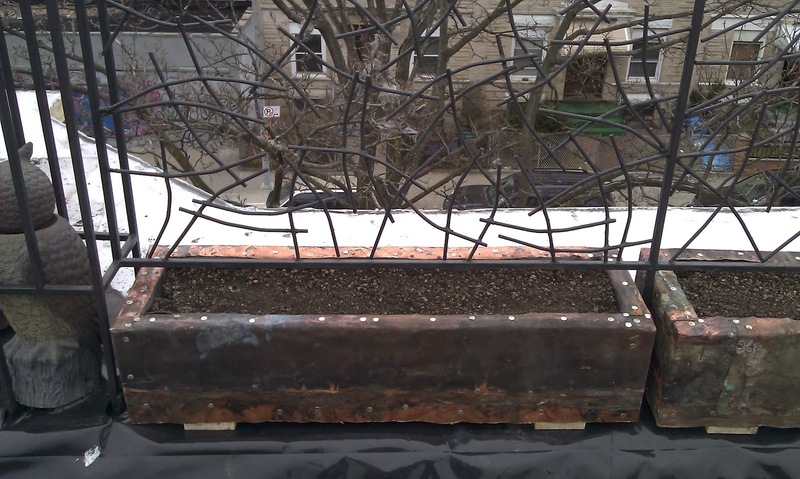 That way, the drainage layer will hold on to some water for the plants to access between rain storms. The next morning, I got up to the roof early and finished straightening out the filter fabric and bolstering the edges with the lumber and bricks. And then the knuckle boom truck arrived! 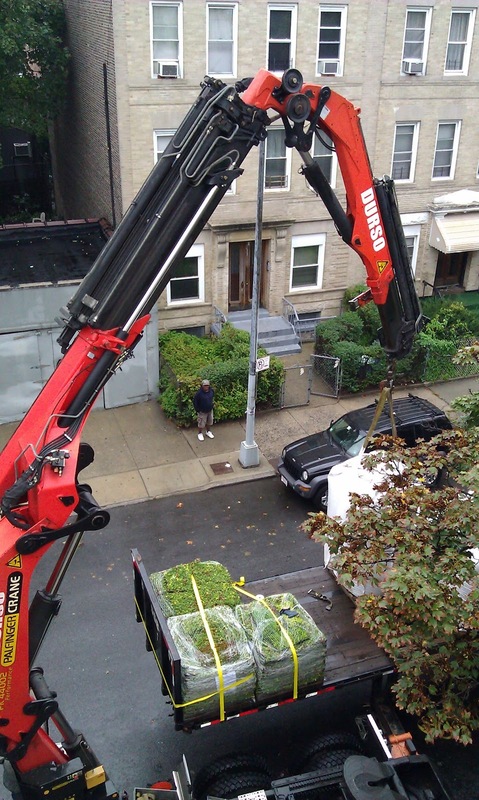 The driver parallel parked the bed, unhooked it, and moved the cab and crane so it was sort of on the sidewalk. There were 6 giant bags of "dirt" and 3 pallets of sedum tiles. Here's the crane with the first bag of dirt attached (partially obscured by the tree). The whole situation was so large, it was impossible to capture the scale of things from my vantage point. 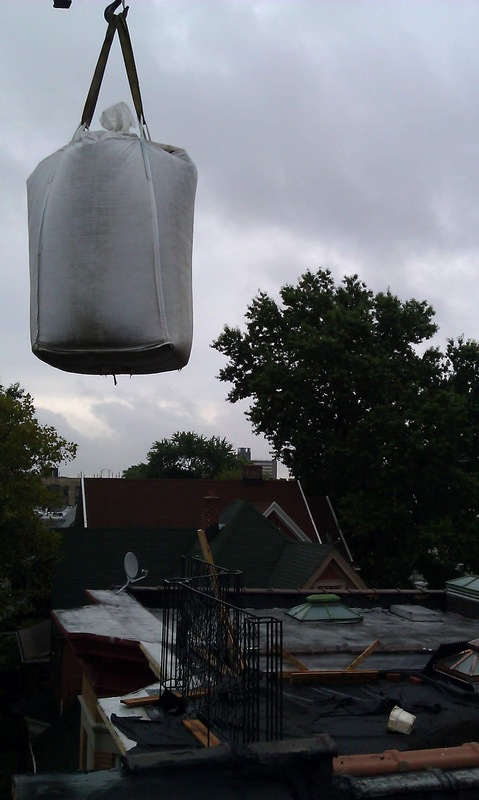 Here's a bag of dirt hanging in the sky - being lifted over the railing. 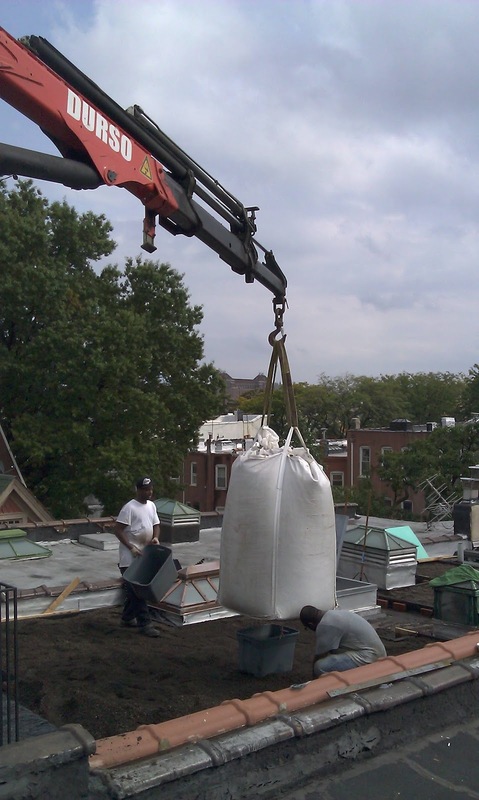 We had the crane operator suspend the dirt bags over the roof while we cut the bottoms of the bags off. Here's a video of that process. And here's another still shot, because it was really cool. We shuttled the dirt around in big plastic tubs, and we dumped, spread, and compacted it all over the roof. 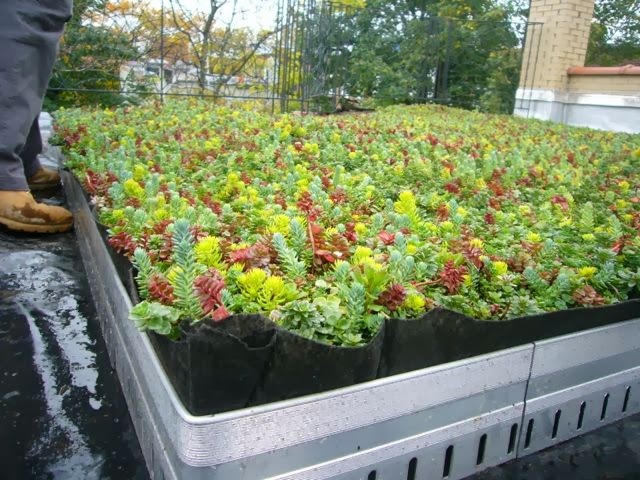 Then we brought the first pallet of sedum tiles up. This made me more excited than it seems appropriate to get over a pallet of sedum tiles. 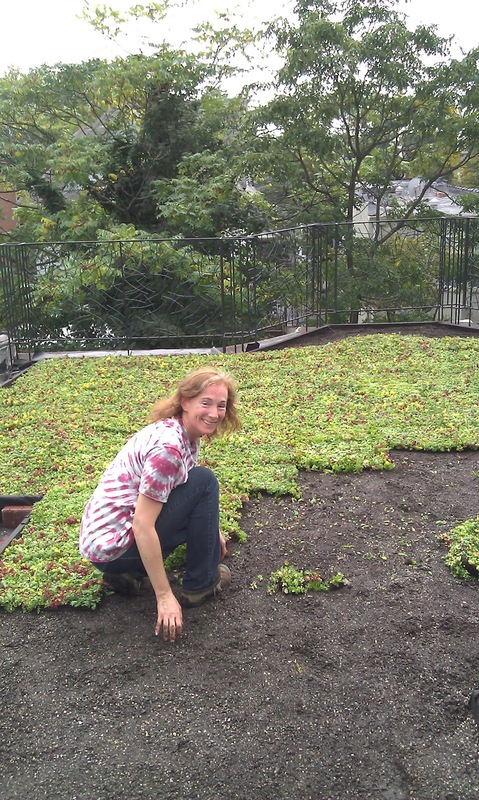 Here's Inger laying the sedum tiles out on the freshly watered dirt. And here's what it looked like by the end of the day! Here's a closeup of the temporary wood-and-brick edging. You'll notice that we left a gap all around the green roof. That's where the drainage rock will go. 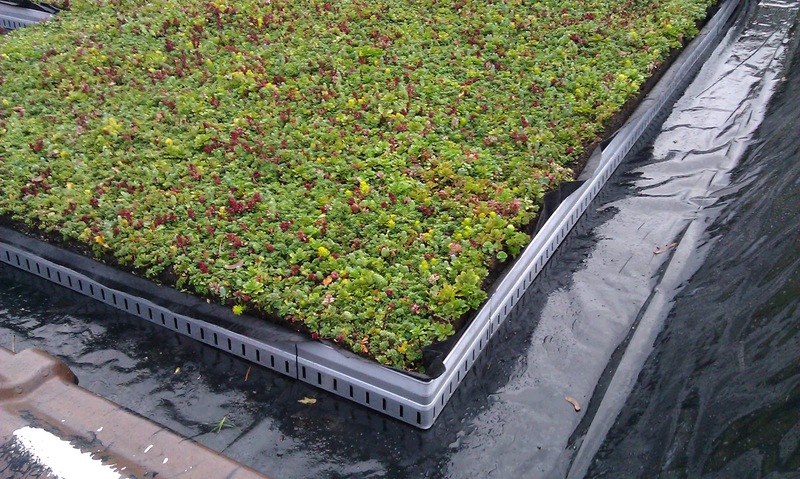 That provides extra protection against plants sending their roots into the roofing membrane along the parapet walls, skylights, etc. 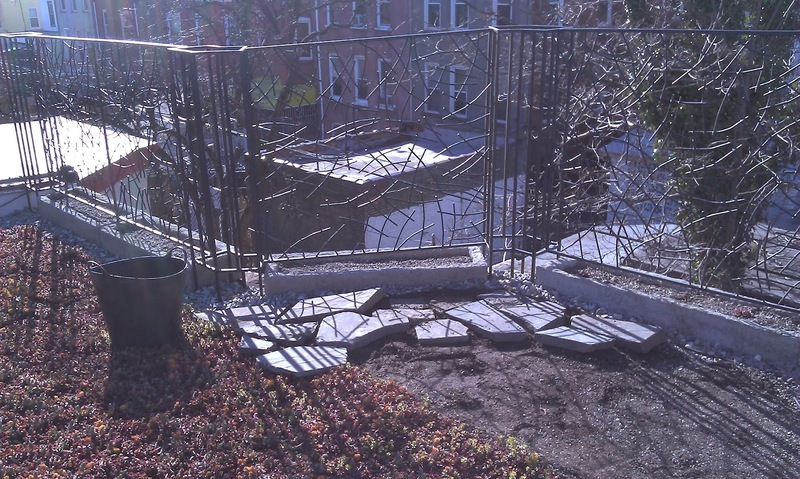 A week or two later, the aluminum edging arrived, and I started replacing the wood and bricks with it as soon as possible. The wood is maple barn wood that my mother gave me, and I didn't really want it sitting out in the rain any more than necessary. 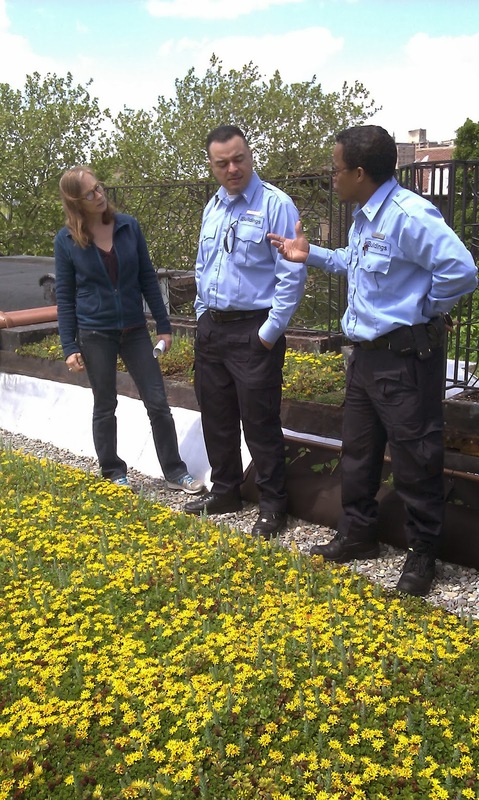 It took me several days to work my way around the entire perimeter of the green roof. I set my gantry back up to haul the bricks and wood down as I replaced them with the aluminum edging. 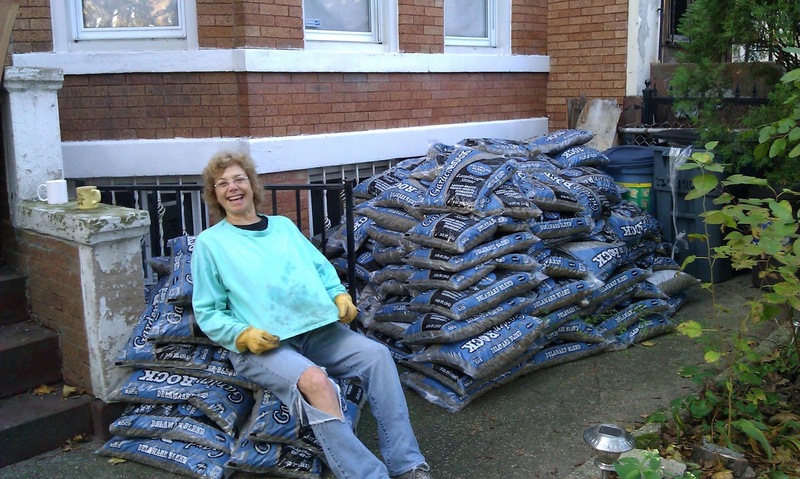 And then, a few more days later, 164 50-pound bags of drainage rock arrived. Before work one morning, a truck with a forklift brought the pallets of bags as far as the front gate, and we brought them into the front yard. Here's Keiter. We had our coffee and tea cups out with us. I think Inger took this picture of me posturing about bringing the rocks up with my strong, claw-like hands. You can see in the background that we had some excess dirt in a bag above the cornice. It took me a while to figure out what to do with all of that dirt. I obviously hadn't finished the edging yet. Here's the first 10 bags of drainage rock after we hauled it up and dumped it in place. Only 154 bags to go! This is another one of Inger's shots - a closeup of the edging and the sedum, with my boot in the background. And here's what it looks like with the drainage rock in place. This brings us to Hurricane Sandy. October, 2012. I was really worried that the wind would be so strong it would get under the greenroof system and lift it off the roof. So I raced to carry enough bags of rock up to the roof in order to be able to surround the entire perimeter with rocks to prevent the wind from getting underneath. I also dismantled the gantry and weighted everything down with bricks. 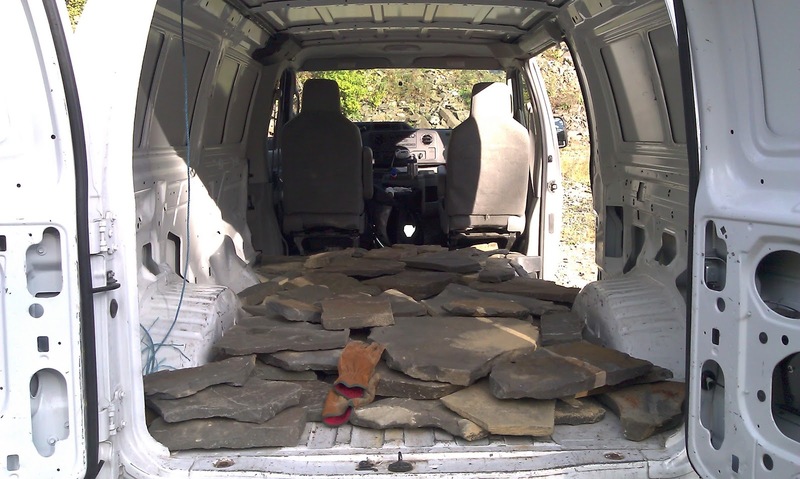 I had been in the habit of hauling 10 bags of rock up to the roof every day that I had the time. But with the hurricane coming, I had to really push myself. I managed to haul about 60 bags up over the course of the two days before the storm. Did I mention they were 50 pounds each? I was pretty proud of myself. 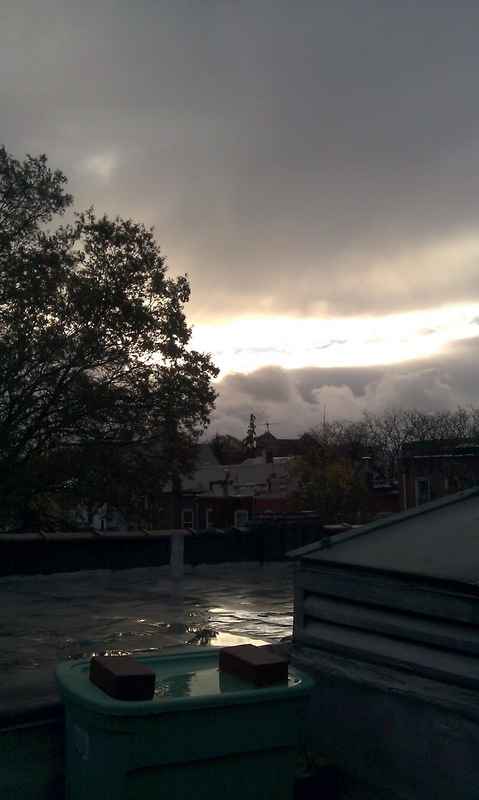 This is what the roof looked like the afternoon before the storm hit. This was what the sunrise looked like after the storm passed. And here's Cindy up on the roof to check it with me. There was some minor leaking around the new skylight, but no other damage. Amazing. 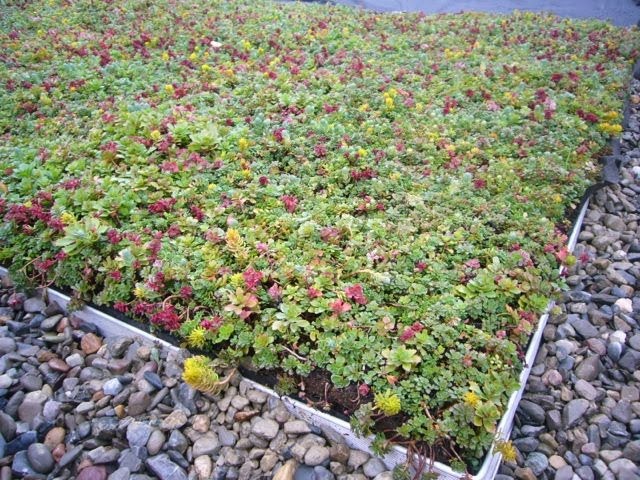 I'm kinda jumping ahead here, but this is how red the sedum get in the Autumn. You can see that big white bag is still up front... there was a lot of work left to do. I needed to get the roof ready for the city inspection. I spent the winter making hypertufa planters to go along the back edge of the roof under the railings. Andrew and I chose hypertufa, because we wanted planters that would stay in place and that would not be susceptible to cracking during the winter. They're also much lighter than full cement planters. 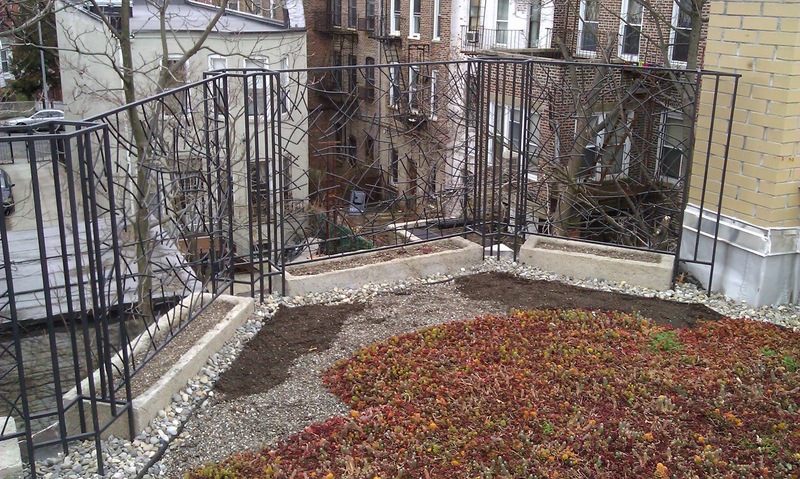 We needed planters there to keep the drainage rock in place and to make sure nothing could fall through the gap between the railings and the roof top. Step one was to make a mold and line it with plastic. My planters would all be the same width, but there were 4 different lengths needed. 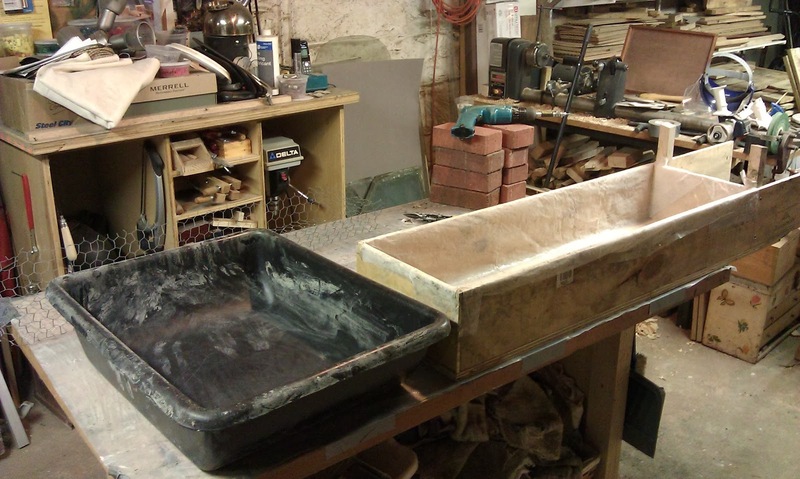 So I made one end of the mold movable and made the troughs in order of size, starting with the largest. 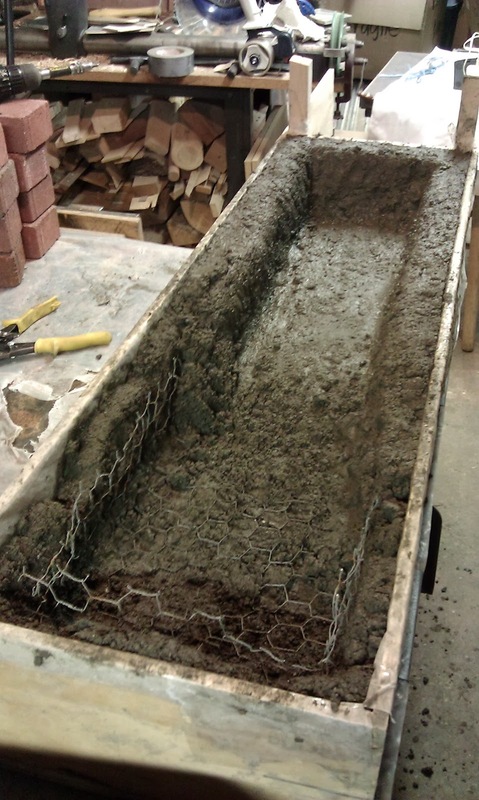 Here's are the mold and mixing troughs ready to go. I got the recipe for making hypertufa from Claudia F. Brownlie's ebook, available at hypertufamolds.net. Here's my peat and pearlite mix. I then mixed in portland cement and water to make the hypertufa mud. I slapped and pressed it into the mold, adding a layer of chicken wire for insurance. The whole process would take several hours of mixing and shaping per trough, partly because I had to wear heavy rubber gloves and protective clothing. 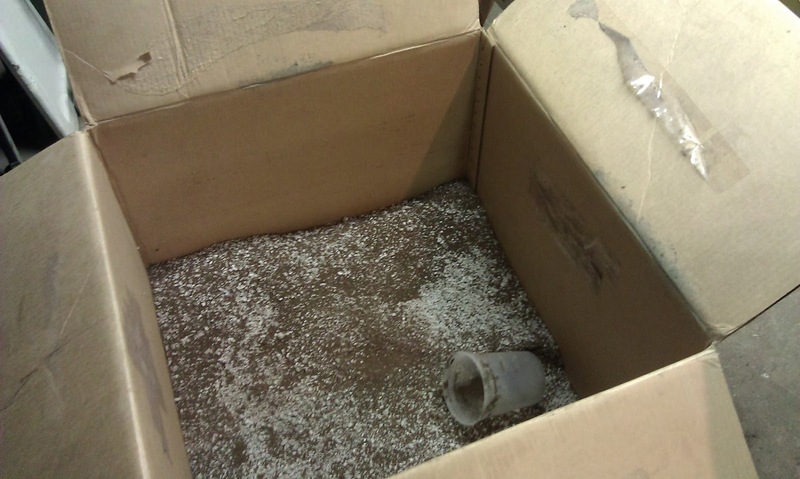 Portland cement is caustic, and direct contact with it before it cures can cause chemical burns to your skin. 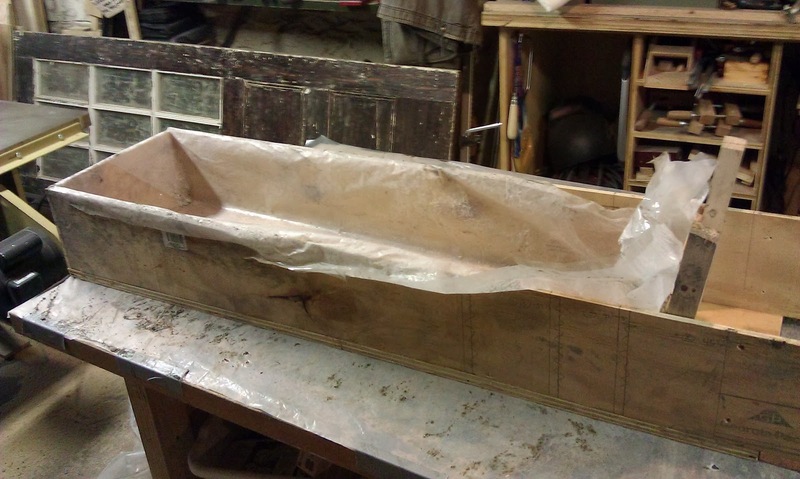 Then the troughs had to be left in the mold to dry for a few days. I could only make one per week. 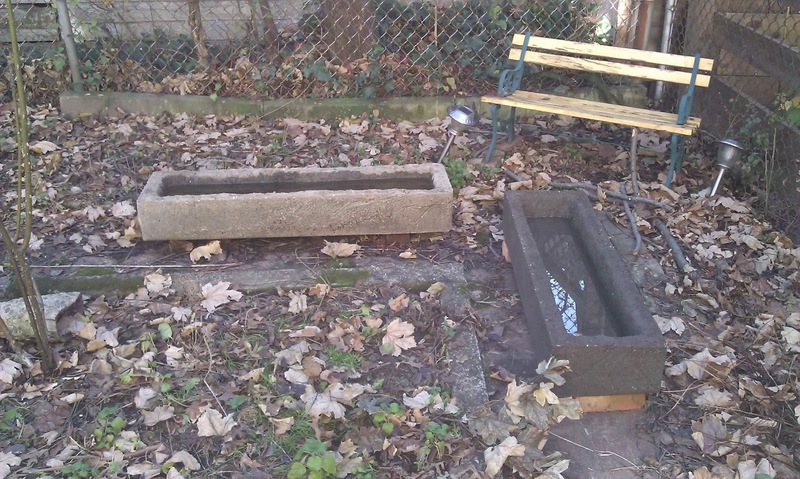 After being taken out of the molds and drying under plastic indoors, I took the troughs outside to further dry and cure. The light colored one had been outside for a week. The dark one was freshly brought up from the basement. They were filled with water to aid in the curing process. 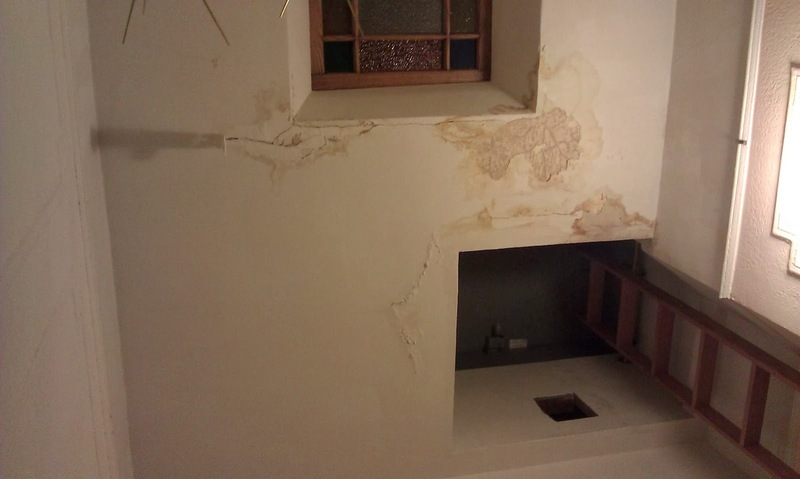 Meanwhile, there was the issue of the damaged plaster from the leak we had during Hurricane Sandy to contend with. The roofers came back and removed the skylight. A tiny hole, the size of a pin was found at one of the corners. I patched it with solder. It's amazing how much water can get through a pin-sized hole! After a couple of months, all the hypertufa troughs were made and cured. Cindy, our upstairs tenant and friend, Ian, and I hauled them up to the roof one morning before work. Here's three of them in place. I turned my attention to making planters to go under the front railing. The hypertufa had been such an intense process, and they turned out to be heavier than I had hoped. So I made wooden troughs for the front. 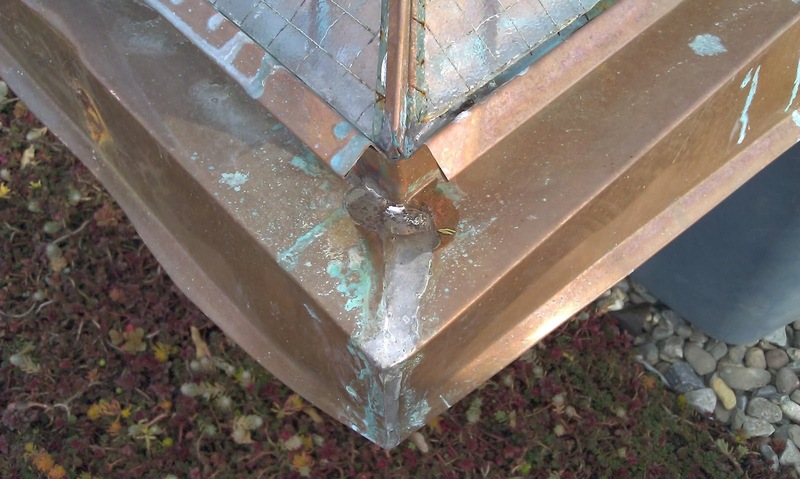 I clad them with copper flashing that I salvaged from the roof of the house when it was re-roofed several years prior. I lined the insides with sheet rubber. 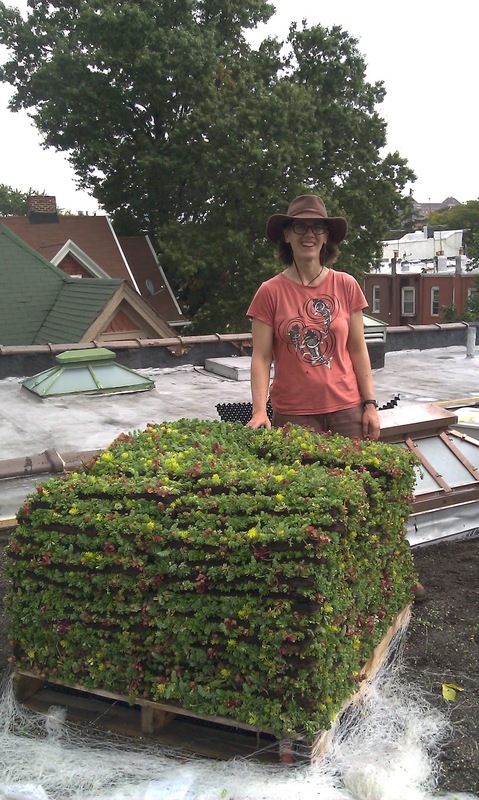 Inger was concerned that the area over the cornice had to have green roof system on it, in order for our project to pass the city inspection. Luckily, we had some extra edging, drainage sheeting, and filter fabric. I covered the aluminum edging with more salvaged copper flashing. The little aluminum posts sticking up from the dirt are going to serve as a base for a bench I plan to build in that spot. 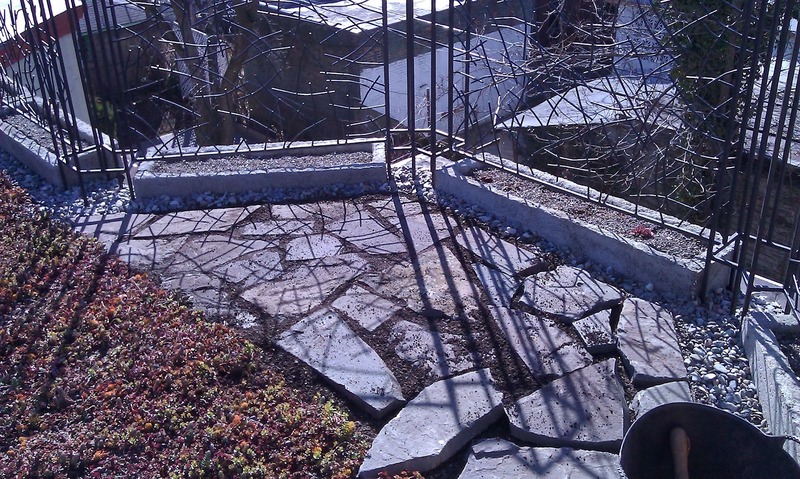 I also started laying bluestone in at the back of the roof where we didn't have sedum mats. 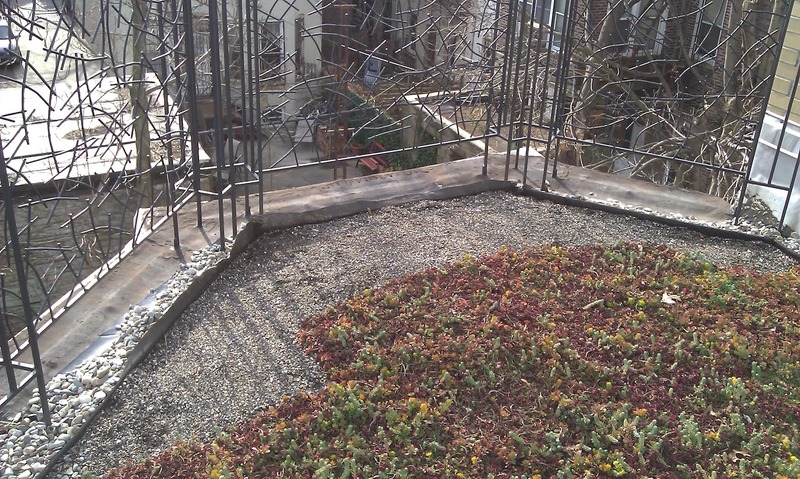 When the bluestone in the back and the little greenroof patch in the front were complete, we were nearly ready for inspection! Lastly, I installed a Wooly Pocket on the front slope to the side of where the bench will be. I planted it with strawberries. A month of two later, in the Spring of 2013, we passed inspection!! Here is Inger, an inspector in training, and Inspector Yap. I could not have been more proud. 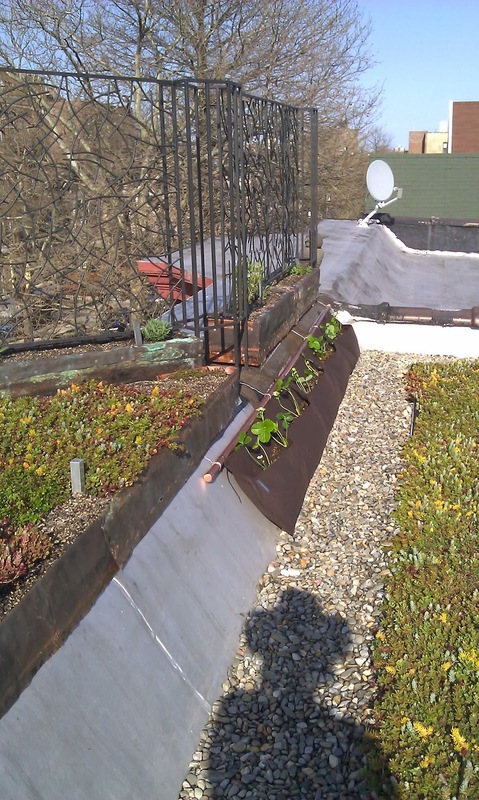 Andrew and I have a lot more ideas in mind for how to make this green roof a garden. I'll add more photos of my progress in future blog posts. 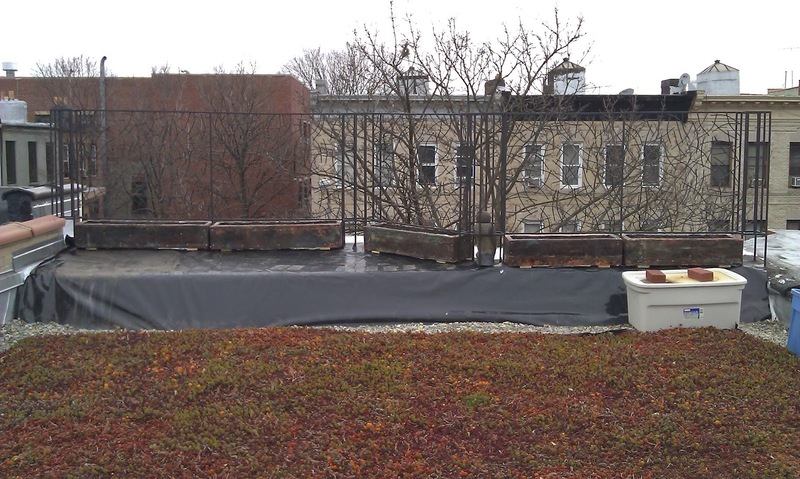 If you have any questions about the process described here, or if you'd like to talk to me about green roofs (one of my favorite subjects), feel free to add a comment below. Lory, I am so impressed! 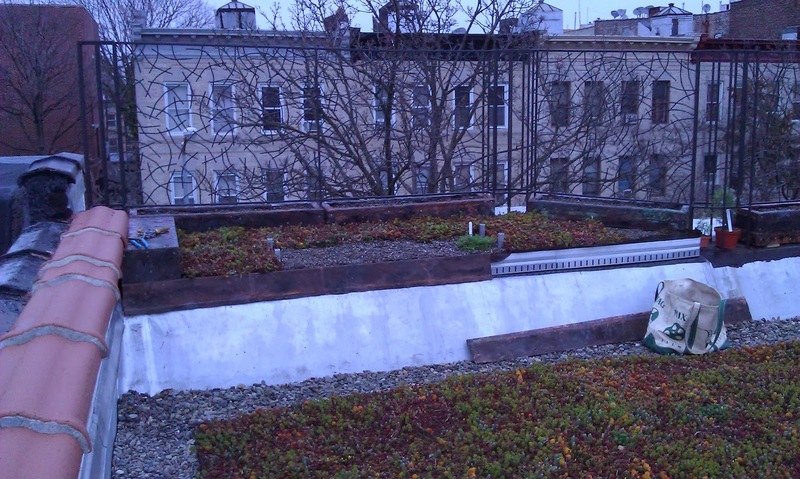 Your green roof is gorgeous. Your diligence has paid off. I can't wait to see photos of your bench and garden. Congratulations! Thanks, Murray! And I'm delighted you made it all the way to the bottom of this page. Talk about diligence! You show an extraordinary combination of intelligence, strength, and green thinking. My admiration and congratulations to you. Thanks, Gary. That's kind of you to say! Great job and I had a few spec questions. I am building a flat roof home here in Nashville Tn. and wanted to have a live/green roof. Did you put five inches of soil on top of your drainage layer? 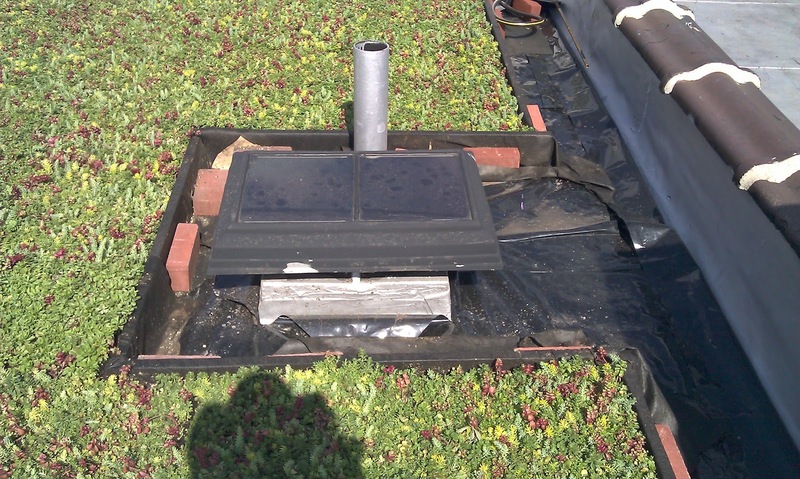 I have thought about adding insulation under my soil, did you check into that option? And lastly what would you have done differently? Thanks for sharing, I am a visual learner and your pictures have answered a lot of questions already. Hi William. To be clear, the "engineered growing medium" aka soil is on top of a filter fabric. 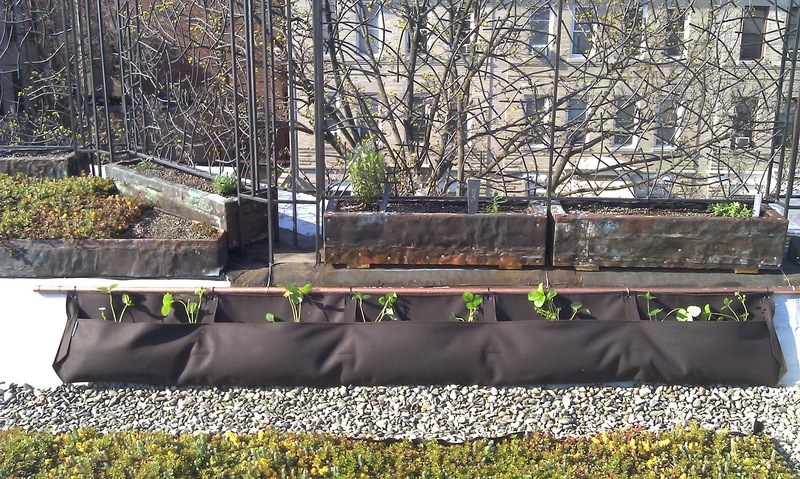 So, from bottom to top, the green roof system goes like this: roofing membrane, root barrier (thick, black plastic sheeting), drainage layer (that's the egg crate stuff), filter fabric, green roof soil, plants. 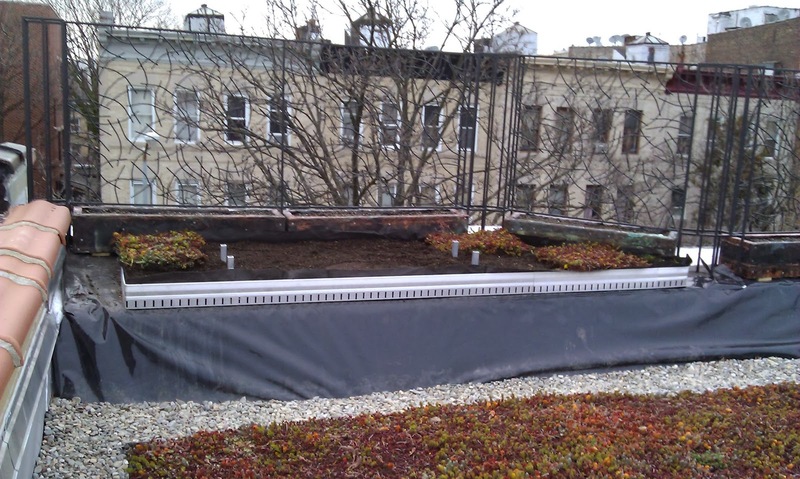 The green roof system is held in place with an aluminum edging, and surrounding that is the drainage rock. Now, in answer to your questions, we do indeed nave 4-5 inches of "soil". That complies with the load capacity we were given by the structural engineer. 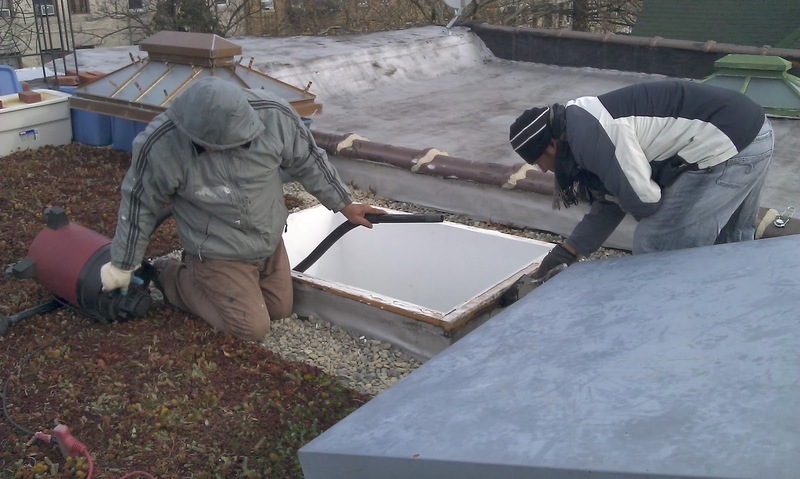 As for insulation, I had the roof membrane replaced several years ago (before the green roof went in). 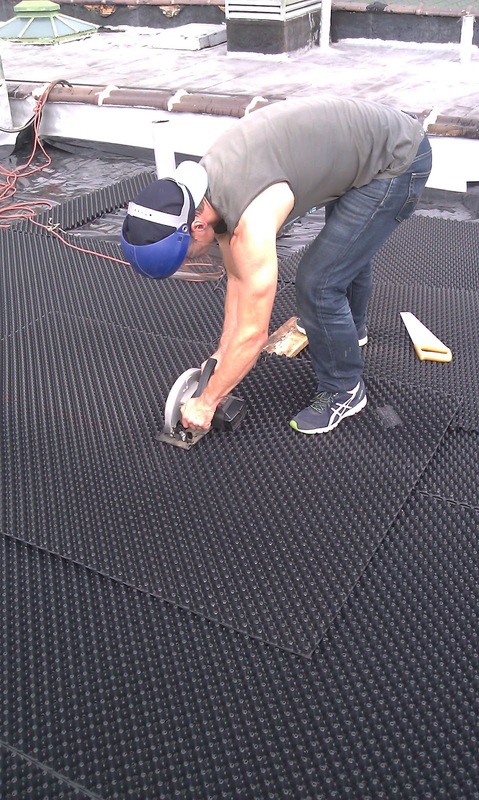 At that time, a layer of foam insulation boards was put over the entire roof under the rubber membrane. What would I have done differently? 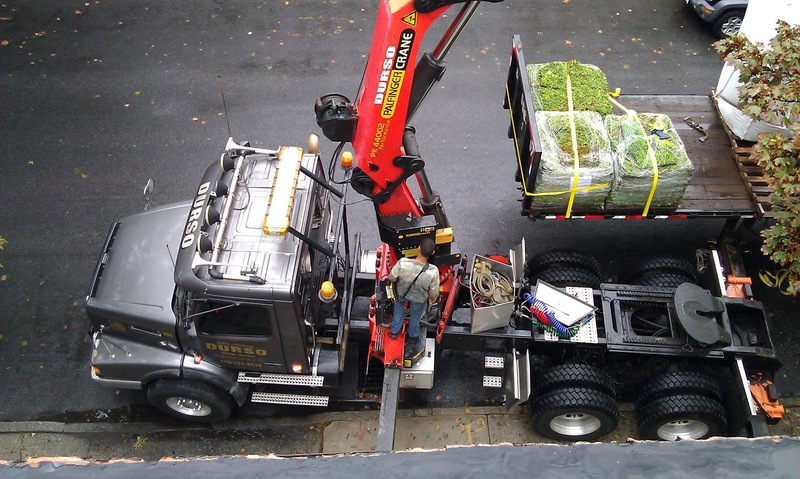 I would have delayed the green roof install until all the components were on-site and could all be lifted up to the house by the crane. Those bags of rocks were a pain! Visually, I would also have made some curves in the green roof system, particularly around some of the skylights. That's mostly to do with how you lay in the drainage sheets and the edging. Square corners are much easier. Anyway, good luck! 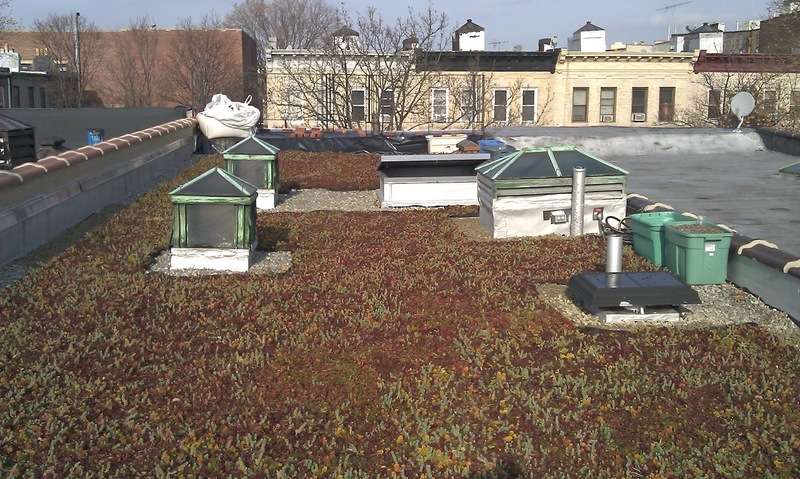 Let me know how your green roof goes! Now that's an idea. 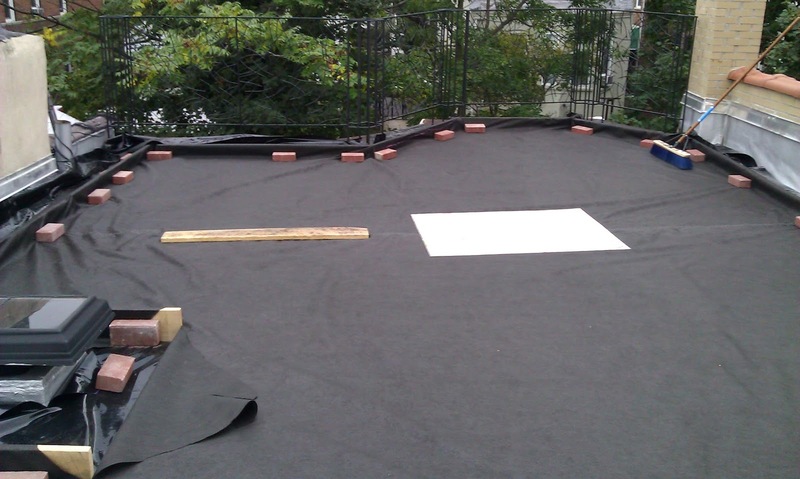 There are more than one ways, in which you can configure or build up roofing, one of which is that. You can literally come up with any roofing solutions and methods, yet safety and preference must always be kept watch on at all times. Kudos! Wow! That looks amazing. Stunning to look at and such an innovative idea. 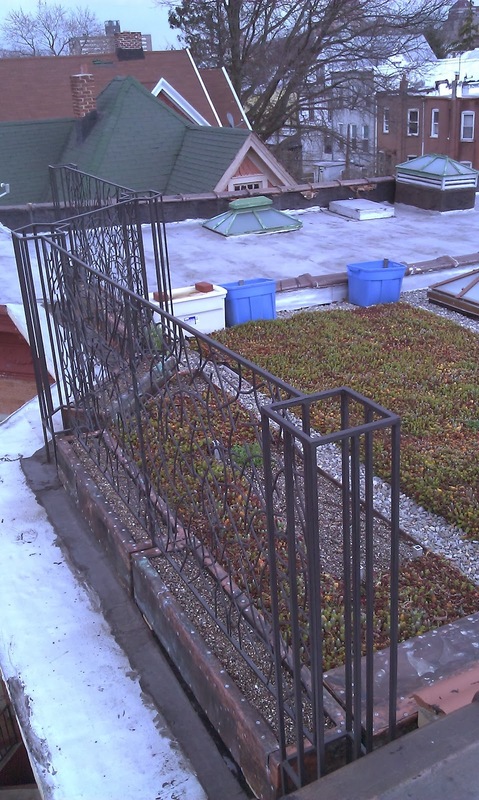 Would imagine that a variety of roofing materials straight from nature would now be possible. Amazing work. Thank you so much. It was a lot of work to get this project where it is today, but it has been worth it by far. Great job done.. This project is super awesome. This project looks amazing. 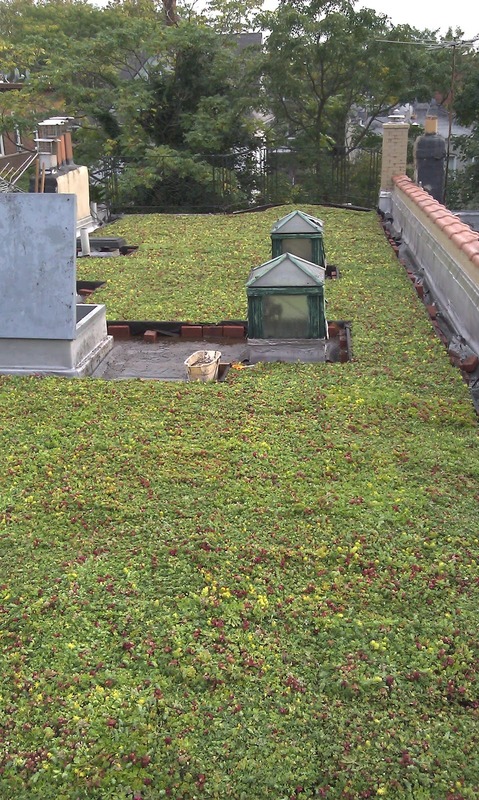 Green roofs last longer than conventional roofs. 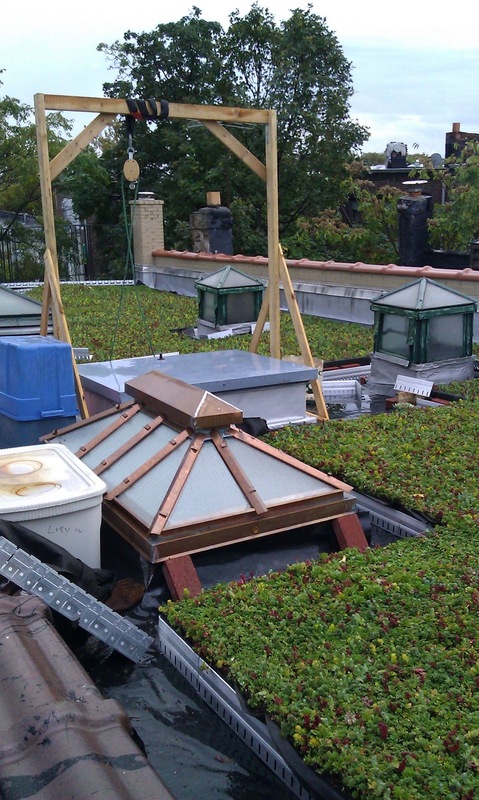 You can also have a look on different types of roofs through- http://emeraldcedar.ca/. Keep sharing such useful posts. Thanks and regards. Given the fact that this entire page is about making a green roof, I don't understand your comment, unless you are only trying to get people to click through to your own web site. Hi there! If you're a robot, if you're mean, or if you're trying to sell something, I'll probably delete your comment.